The above info came from Miguel Balauag, and was edited by yours truly (contact me). The image came from Amazon.com. This Gainax gem is definitely more for the otakus. Sasshi and Arumi, two kids in the shopping district of Abenobashi (a city in Osaka), discover that there's a secret magical force behind Abenobashi. One day, the magical force gets broken, and suddenly everything is no longer what it seems! Episode by episode, they get transported to parallel versions of Abenobashi, each with its own genre to spoof! You'll see them in the fantasy-based Sword & Sorcery Shopping Arcade, the sci-fi and mecha world of the Milky Way Shopping Arcade, the detective-noir streets of the Hard Boiled Shopping Arcade, and many others! 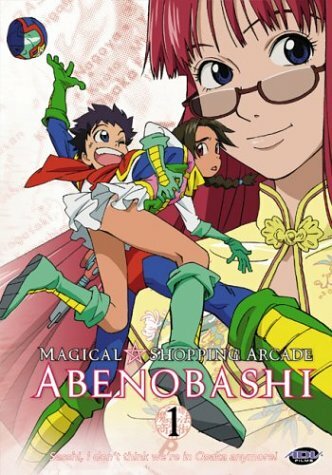 Abenobashi is a hilarious ride of misadventures, delivered in a typically Gainax fashion. There are a few times when the series is more serious when it gives you information about the characters and their history (like the first episode and the eighth episode that flashes back to show the origin of the shopping arcade). But the rest of the series is delightfully playful, especially if you can understand all of the jokes and references. The above description came from Miguel Balauag, and was edited by yours truly (contact me).